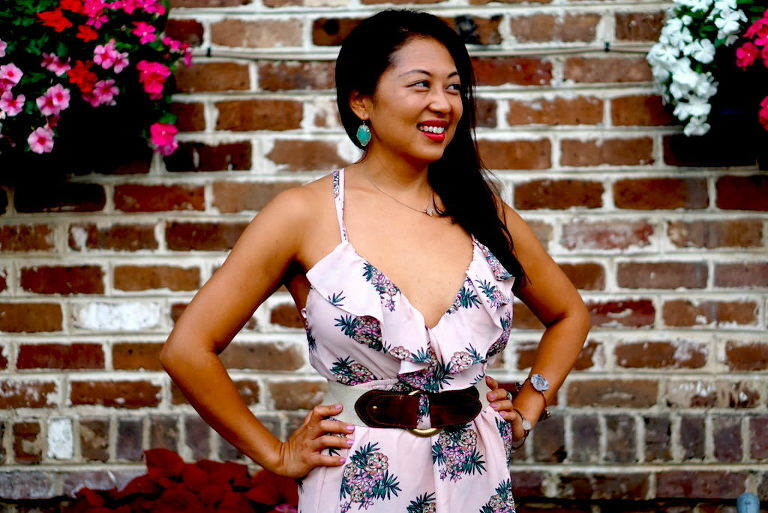 If you’re looking for a romantic weekend getaway or girls trip/bachelorette party ideas, you should definitely check out Savannah, Georgia. 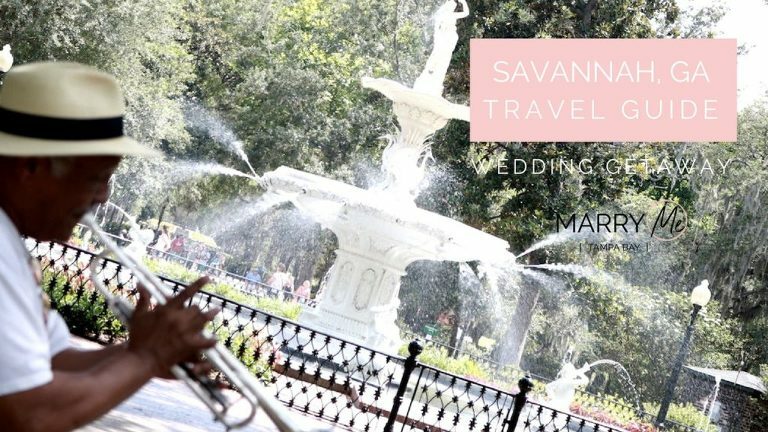 Known for it’s chill vibe, great restaurants, historic architecture and beautiful scenery, Savannah is a classy option for a road trip from Florida. Savannah is a five-hour drive from Tampa. I found that flights there are pretty expensive from Tampa Bay, so you’re probably better off road tripping. We stopped off in Jacksonville for lunch, so that helps break up the drive, as it’s just two hours from there. What’s great about Savannah is that it’s a small town that packs a big punch. I went on a romantic getaway weekend with my boyfriend, but we also saw TONS of bachelor/bachelorette parties too. To me Savannah was all about the food, photos, and history. It’s small enough that you can get around on foot for the most part, and you can have pretty relaxed days. Very little needs to be scheduled ahead of time, so you can just go where the day takes you. If you love beautiful backdrops for Instagram-worthy photos, you literally will find one on every corner. We spent countless hours snapping pics the entire trip. Bring some cute outfits, because Savannah will leave you with pictures for days! The shopping in Savannah includes local shops and tourist sites. We stopped off at an open-air market along the Riverfront and picked up some amazing smelling lotions from a local booth. My favorite shopping was near the City Market area. The shops were a bit less touristy, and they had some mainstream stores there too. We picked up some clever t-shirts at a southern men’s clothing store and spent a couple of hours browsing local artists’ galleries. At night, there was live music and the whole street was shut down so people could dance and have fun. I would recommend staying near this area if you want to be right in middle of the action. 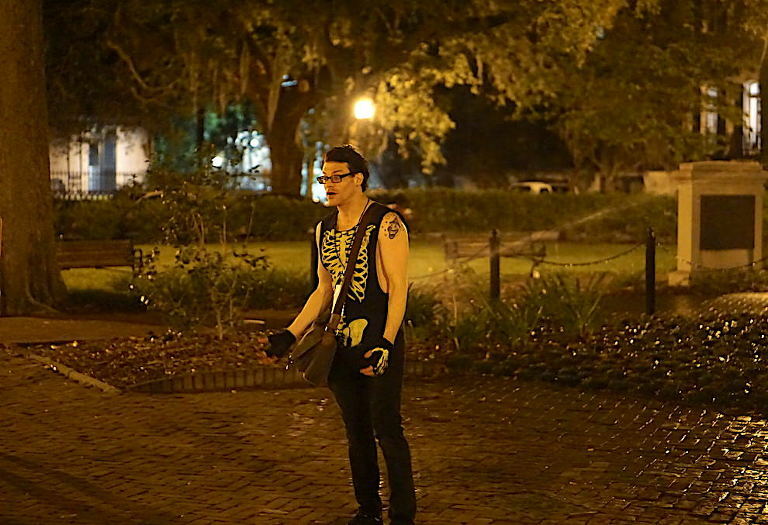 You can’t visit Savannah without going on a ghost tour. 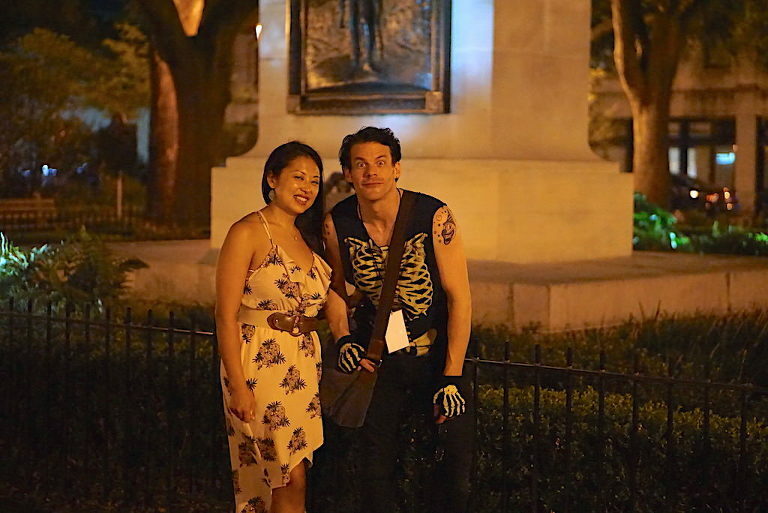 After doing some research online, one name kept coming up on review sites and other blogs, Ghost City Tours The Night of the Dead Ghost Tour with Skippy. We did the tour the first night we got there to get acclimated to the city; it starts at 11 p.m. so you may need a nap before, but it was a great combination of the city’s history with some creepy fun mixed in. We walked through the famous squares, past graveyards and historic haunted houses, while Skippy told us the stories behind ghosts and even showed photos of some spottings. He had a unique personality and was a great story teller, without being cheesy. As hard as we looked, we didn’t see any for ourselves, but we still had a great time immersing ourselves in Savannah culture. Tours run 7 days a week and cost $29.95, though The Night of the Dead Ghost Tour website often offers 10% off coupons. The most important part of any romantic getaway weekend is the food, and Savannah is filled with amazing local eateries. On our first night, we met with my bae’s friends who are locals and they took us to our favorite restaurant of the entire trip. 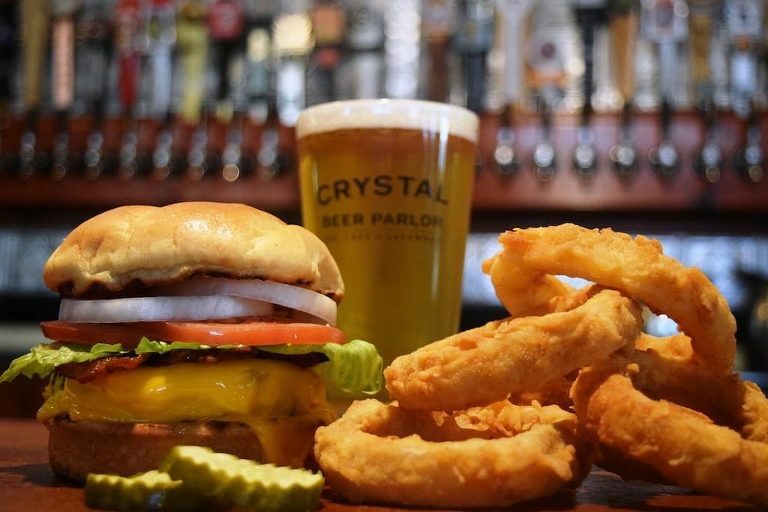 I received tons of recommendations from other friends who have visited the area and this place wasn’t on any of their lists, but we still talk about the peach cobbler at the Crystal Beer Parlor. It’s just good food with a laid back atmosphere that isn’t fancy or hipster. This is the #1 restaurant we recommend to anyone when they tell us they’re going to Savannah. It touts itself as “Savannah’s oldest restaurant,” opening in 1933. The ambience is laid back, and the walls are filled with historical news clippings and signs, which matches perfectly with the historic Savannah vibe. My boyfriend, an Italian from Chicago, tried his first fried green tomatoes here, which he loved! I’m not usually a “burger and fries” type of girl, but this a restaurant I would want to go to have a splurge. The wings were amazing (and I don’t usually order that either). As I mentioned before, the real winner was that peach cobbler. Georgia is known as the peach state, so you really do have to have try the local peaches at least once while you visit! One the most famous restaurants in Savannah is the Olde Pink House. Located in an 18th century mansion, It is epitome of fine dining in the south. The gorgeous chandeliers and elegant, traditional southern style will make your feel like a debutante. You’ll definitely want to break out a suit jacket and dress for the restaurant, and make reservations as soon as you can. We ate in basement, which was dark and candlelit, and adjacent to their famous bar. It was definitely a dining experience, as we sat at high back leather chairs in front of the fireplace, but it does tend to get louder and more crowded downstairs because of the bar. The food was really good and the service was great (which we found with a majority of the restaurants), but for the price tag, around $150 for dinner for two with appetizers and dessert, I don’t know if it’s worth the splurge. However, it is one of those restaurants you do want to say you’ve been to because it’s so famous. B.Matthews Eatery was a top brunch spot on our list of recommendations, and while the food was good, it wasn’t our most memorable, so I wouldn’t go out of the way to eat here. I was so excited to try the Fried Green Tomato Benedict, but was I left a little disappointed. I had no complaints, but nothing really stood out, except for service, which was really amazing. Collins Quarter, however, was one of my favorite meals; the Avocado Smash was the perfect refresher after a weekend indulging. While we didn’t partake in any drinks, they looked amazing, and the staff was very friendly (as with most restaurants in Savannah. )The atmosphere was hip and chic and had a warm, inviting feel. I would highly recommend making a stop here! Treylor Park was the biggest disappointment for food, though it was highly recommended on Yelp and other travel blogs. Maybe it was because it was our last meal, and we had been so indulgent, but it was not worth the calorie splurge. The atmosphere is very casual and would be a great hangout for a group of girls or girls from some day drinking at the outdoor bar (there is also indoor seating), but it’s definitely not a romantic or date night spot. They did play Mean Girls while were there, so I’ll give it props for that. We left on a Friday morning and didn’t arrive until after lunch, so we missed out on Mrs. Wilkes Dining Room, as it’s only open 11 a.m-2 p.m. Monday-Friday. (Get there early, the line starts at 11 a.m.) On my next trip I will make it a point to eat there!